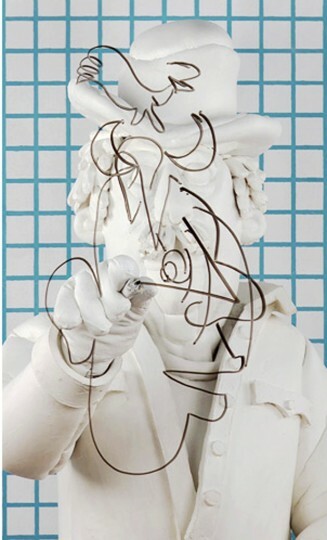 Employing a disarming DIY approach to his own highly-visual brand of absurd, yet psychologically-charged video art, Bress has assembled an impressive collection of video pieces that – given their color-coordinated frames, nearly static imagery and occasionally recognizable allusions to specific painters or artistic periods – read much more like paintings than narrative video. Also accompanying these relatively static videos is a more traditionally narrative video piece, which (notwithstanding a moment or two of irritating artworld condescension) sets the otherworldly tone (and soundtrack) for the rest of the show. This is the effect: what at first glance appears to be a gallery of lusciously-colored paintings turns out to be video portraits of imaginary figures standing and gesturing in front of elaborate backgrounds. The strange and wonderful aspect of this methodology is that each piece feels as though it is a portal into a living world of art, and is a very effective vehicle for bridging the conventions that so often separate artwork from its audience. Combine art viewing habits with well-honed, passive-zombie-television viewing skills and voila – mainline Bress’ imagination. In Cowboy, a Sid and Marty Krofft-like figure delivers a cartoon-y drawing demonstration on the screen that divides the world of video from the world we inhabit. 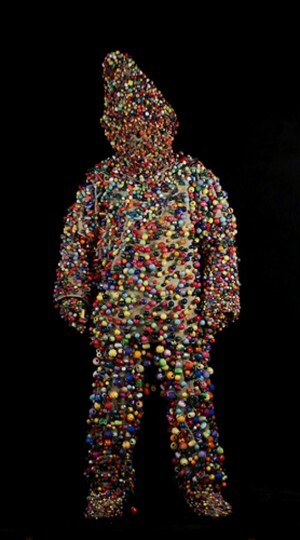 In Beadman, a shaggy, beaded, vaguely Snuffleupagus-like figure bounces up and down. 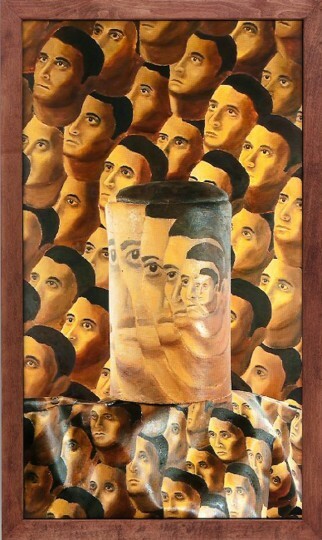 Infinite Man suggests an undulating army of men ala 30’s propaganda art, another piece (Relatives) is reminiscent of David Hockney’s pool paintings, and a diptych (Pair) resembles some of Francis Bacon’s more disturbing visages. The uncanny and eclectic imagery initially seems the product of slick video effects, but as the painstakingly handmade quality of the costumes and backdrops becomes more apparent, so too does the paradoxical friction between the generous intimacy of the artist’s hand and the cool anonymity and claustrophobia-inducing stasis of the heavily-costumed figures on screen. Though Under Performing is by-and-large humorous and friendly, the show is also quite disarming – knowledge of the who, what, when and where are all but denied us and only the imagination and an odd sense of intimacy remain. The show is something akin to the unexpected pleasure of unwittingly falling victim to a gentle alien abduction.